It's my brother and sister-in-law anniversary this week and as usual I waited until the very last minute to make a card. Hope you enjoy today's video. I'm a little disappointed on how the pictures turned out for this one. I think I may have forgotten to hit the white balance button on my camera. Adorable card! 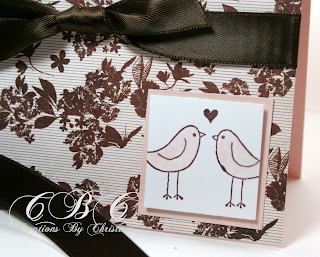 I worked with the love birds stamp over the weekend and really liked it.